gamingrepairparts has no other items for sale. Enjoy precision gaming control with the Sony Dualshock 2 gamepad. You can rely on this controller for an intuitive gaming experience. It is a wired device, which connects easily to the console. 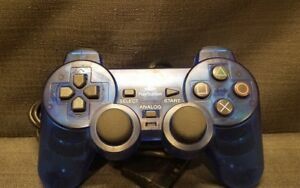 This controller can be used with Sony PlayStation 2 for bringing entertainment to the next level right in your home. I'm EXTREMELY happy with my purchase! The price was unbeatable, the product, no longer even made- looked near-brand-new, and I was extremely impressed with the wrapping of the chord and its condition. Few know how to take care of electronics so well. The only thing, albeit inconsequential that was in error of this device was the Red LED light indicating Analogue. It turns on and off, most of the time off, either randomly, or due to the pressure of the control. If I grip it tightly, it is on, otherwise it varies. I assume you or someone may have taken apart or repaired this device before, but despite this light (which I could fix if I wanted) it seems one hundred percent functional in either state. I am incredibly happy with my purchase and its condition, and the shipping was faster than expected. I have a controller again, and you are my hero, haha. Much thanks, and much love for fellow respect in electronics! I got my controller a few days ago, and am happy to see that it works very well and feels just like my old PS2 controllers. The price is fantastic for such a high quality controller, and my only complain is that the quality of the item is used and not new. It came with some grease stains, and part of the right thumbstick is coming apart. Despite this, still a great product at an unbeatable price, just keep it mind that it is used. True classic controller. It has always been my favorite controller design. The one I purchased was brand new, and arrived just as good as the one that came with my PS2 years ago. Sony made the best controller for their system. While some of the off brands are okay, nothing beats the response time of the original product. A must have for collectors and retro game fanatics.